Have you been watching the heavy rainfall this summer and wondering what you could do to either slow down erosion or capture the water for yard use? How about concerns about your watershed and what the sudden and heavy runoff from rain events? Rain gardens, rain capture systems, water features and permeable pavers are a natural fit and can be created for you by Waterpaw. As Master Certified Aquascape Contractors we are proud to offer a variety of solutions for rain water and runoff. Our Rain Capture Systems are custom made for every home and water solution you are looking for. Is your well water rusty and staining your yard? If so, an underground rain capture reservoir to use for irrigation supplementation might be a good idea. Or, if your city water bill is pretty high to keep up with your vegetable garden imagine using free rain water to grow your tomatoes (not to mention keeping chlorinated water out of your home grown food). Perhaps you are looking to reduce your runoff impact from your driveway or patio. A permeable paver that gathers water to run into a rain garden will help keep your watershed healthy and your yard less prone to erosion points. Water is a precious resource and keeping our Northern Michigan watersheds clean and healthy is essential to the continued health and beauty of our area. If you are looking to reduce your impact, keep your yard greener, and reduce erosion give Waterpaw a call. 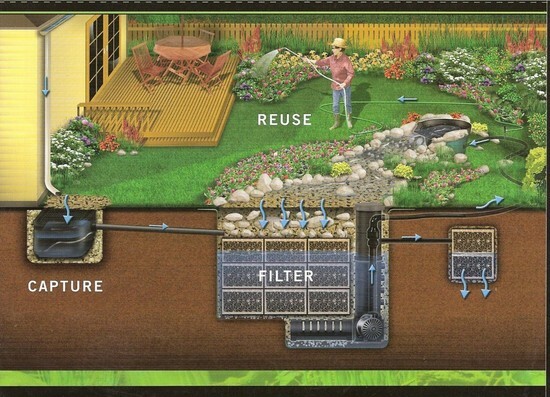 Our website has a page devoted to rain water capture and rain gardens. We are excited to be part of the awareness of watersheds and health by integrating your modern yard with techniques to keep your impact low and beneficial. This rain capture system gathers water from your roof and stores some for garden use while using an overflow to further filter water before it re enters the ground water. This system can be used under driveways as well. It can even run a water feature for you. Thats 3 jobs, one reservoir and a happy watershed! Rain gardens gather rain fall and run it through filtration and dry creek beds to both slow down water to keep it out of storm drains and filter the pollutants it picks up from our yards and driveways. Rain capture systems gather the rain fall and runs it through filtration but then rather than releasing it into the watersheds or storm drains it stores the water for later use by the homeowner. Whether for landscape watering, garden watering and or water features these systems offer you flexibility and lower landscape water bills. These Aquascape Rain Capture Systems are being used worldwide in both commercial and residential applications and are made of recycled materials. When you are ready to do more with your runoff call or contact Waterpaw.